Our core products are Mirror finish/ Super BA coil/sheet/strip with ANTI-FINGERPRINT and TITANIUM COATING. Both Super BA/No.8 finish can be coated with anti-fingerprint resin that improve its fingerprint resistance, the hardness of film could be 6H-8H that the film will not be faded within 20 years. This kind of material is generally applied to high value-added products like architecture decoration, elevator doors, and refrigerator doors. 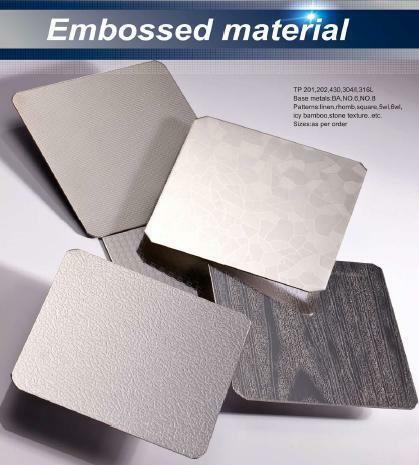 stainless steel material with embossed, titanium and etching surface.